Cards cannot leave the Runner's heap for any reason. Rezzable for 0, trashable for 3 - good ratio, and sets back a good amount anybody using Same Old Things, Clone Chips or Déjà Vu. Which basically means... anyone. No more Account Siphon every turn, no more insta-Parasites and Shapers can forget about their programs you have trashed earlier. 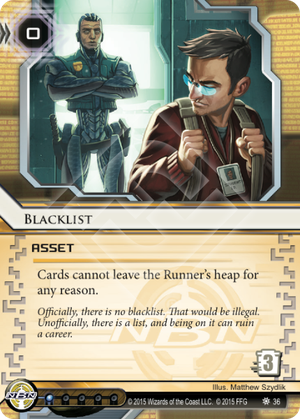 Levy AR Lab Access does nothing at all (except drawing the Runner five cards, but that's not what this card's role is). Exile and MaxX can already concede once this hits the table - that is, if the server is secure enough, or maybe not secure, but you catch them off-guard and without resources to spare. One influence a piece. Worth adding to any deck to spice things up a bit given you have one influence to spare. Be careful not to shoot yourself in the foot if you find yourself running Chronos Project.